Paul Sparrow on the set of America's Most Wanted. 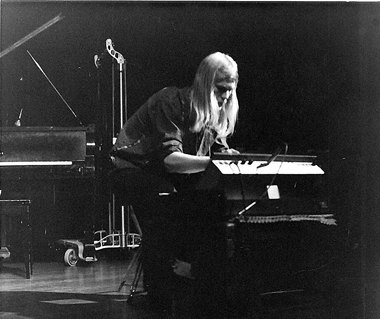 Sparrow during his thesis concert at UC Santa Cruz in 1977. Editor's Note: In June, Sparrow was appointed as the new director of the Franklin D. Roosevelt Presidential Library and Museum, starting July 26. The Roosevelt Library is one of 13 Presidential Libraries, which house the records of Presidents Herbert Hoover through George W. Bush and preserve and provide access to historical materials, support research, and create interactive programs and exhibits. As a successful TV producer, Paul Sparrow helped catch murderers and child abductors. He guided a 100-person production team across the wilds of Morocco to document one of the world's toughest adventure races. 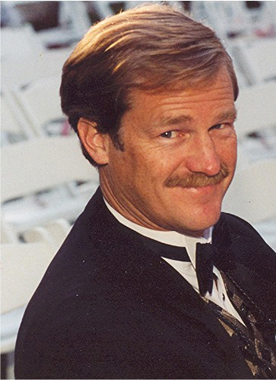 He directed more than a dozen documentaries and 300 hours of primetime TV, and won two Emmys. But ask the 61-year-old Sparrow about the accomplishment of which he is most proud and he'll skip all talk about awards and primetime TV. Instead, he'll tell you about being part of the team that helped design the Newseum, a museum of news and journalism that draws 750,000 annual visitors to its site on Pennsylvania Avenue in Washington, D.C.
"It's an extraordinary facility that tells an important story," said Sparrow (Porter '77, music), who serves as the Newseum's senior vice president for broadcasting and new media. "The First Amendment has never been more critical." Television and the First Amendment were the furthest things from Sparrow's mind when he came to UC Santa Cruz in 1975. Instead, the East Coast transplant wanted to study electronic music, and the coastal campus was one of the few colleges that not only owned a Moog synthesizer but also taught it. Inspired by luminaries like Music Professor Gordon Mumma and visits by avant-garde artists like John Cage and Roger Reynolds, Sparrow helped develop a music guild, which supported numerous concerts on campus. He earned a graduate degree at the Center for Contemporary Music at Mills College in Oakland but discovered after graduation that electronic music wasn't exactly a profitable line of work. His trajectory changed when he was hired to work as a sound engineer for a documentary film about elephant seals at Año Nuevo State Park. "(UC Santa Cruz Professor of Ecology and Evolutionary Biology) Burney Le Boeuf was the first guy I worked with," Sparrow remembered. "In a way, I went full circle because that's how I got into film and TV." Sparrow moved steadily through the television ranks after that first two-year project: from KPIX TV in San Francisco to co-executive producer for Fox's America's Most Wanted to executive producer of How'd They Do That, and, finally, senior producer of the Emmy-winning Eco-Challenge: Morocco on the Discovery Channel, the brainchild of reality-TV guru Mark Burnett. "I found that making film and producing television has the same components of music," Sparrow said. "It's an ensemble sport. It's all about team. It has cadence and tempo. A lot of structural issues around storytelling are very similar to music." But by 1999, Sparrow had become a new father, and the grueling schedule that included 60-hour workweeks and months-long stretches of travel was wearing thin. He shifted gears again, and was hired as part of the team that designed and built the Newseum at its current location. There were exhibits to plan, scripts to write, documentaries to make. One of Sparrow's films—a look at the media's coverage of the Holocaust while it was occurring—won him an Emmy nomination and CINE Golden Eagle and New York Festivals awards. "Our mission is to champion the five freedoms of the First Amendment," said Sparrow, who is considered an expert in new media. "We are the largest program to support the First Amendment in the world." Now working on a new exhibit about the press and the Vietnam War, and updating an older FBI display, Sparrow said he is struck by the impact of the Newseum on its visitors. He sees people walking out of the 9/11 gallery with tears in their eyes and watches visitors standing enthralled by the photos in the exhibit dedicated to Pulitzer Prize winners. "One of the things I learned at UC Santa Cruz was to follow your passion," Sparrow said. "Committing myself to something I'm passionate about is what has laid the foundation for everything I've accomplished."